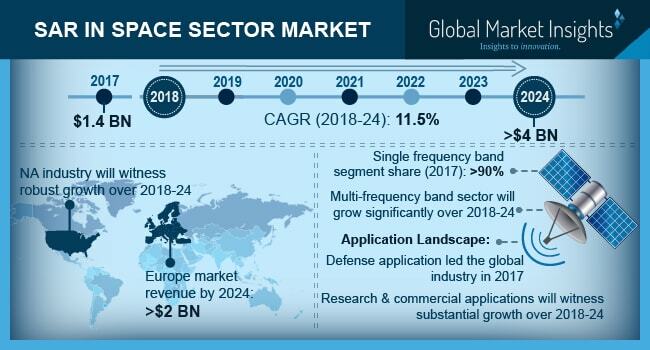 Synthetic Aperture Radar (SAR) In Space Sector Market size is estimated to exceed USD 4 billion by 2024; according to a new research report by Global Market Insights, Inc. Remote sensing solutions for developing high resolution imagery for applications of earth observation, weather monitoring, biomass measurement, space exploration, and ocean monitoring is expected to provide strong growth opportunity for SAR in space sector market. Moreover, capability of these systems to perform efficiently, even in absence of light and cloudy weather conditions will inadvertently propel the industry growth. Europe accounted for the largest share in 2017, is expected to cross USD 2 billion by 2024. This can be credited to the high number of projects in Russia, Germany, the UK, and Finland. Moreover, high emphasis of European Space Agency (ESA) on navigation, earth observation, scientific program, technology support, and situational awareness has significantly contributed to the industry growth. According to the ESA budget for 2018, over 52% of the assigned budget capital was dedicated towards these activities, driving the SAR in space sector market growth. Growing commercialization of imagery data obtained through these satellites are among the major trend gaining traction in the SAR in space sector market. Requirement to capitalize on these business opportunities has in turn led to intense competitive scenario among the industry participants. For instance, in October 2015, U.S. Department of Commerce (DoC) provided the license to XpressSAR Inc. to operate commercial and private space based synthetic aperture radar sensing system. It was the first wholly U.S. owned company approved to operate constellation of four commercial X-Band radar satellites. High development, deployment costs and complexity in proper utilization of the obtained image data are expected to remain the prominent growth inhibitor of the SAR in space sector market through the forecast period. Moreover, large space footprint and heavy weight architecture also contribute to the overall costing of these satellite missions impacting the industry growth negatively. Industry participants are expected to increasingly emphasize on the size and weight reduction of space borne radar systems and enhance the overall image resolution to gain competitive edge over their immediate competitors. For instance, Iceye launched its first micro-satellite with synthetic aperture radar featured with the ability to generate two and three-dimensional imagery in January 2018. These technological advancements are expected to provide strong growth prospects to the SAR in space sector market over the forecast timeframe. Single frequency band contributed the largest industry share in 2017, owing to its conventional applications in the military operations. X band was the largest frequency bandwidth in utilization in 2017 and is expected to continue its dominance over the forecast period. This can be attributed to its extensive applications in geographical mapping, military surveillance and reconnaissance. Research & commercial applications are expected to witness inorganic growth over the forecast timeframe. Significant growth opportunity in the disaster management, weather updates, meteorology, navigation and natural resource exploration are among the dominant end use that will provide the strong growth prospects to the SAR in space sector market. For instance, multiple constellation projects in Canada are expected to largely focus on the maritime navigation and ocean surveillance for tracking the trade and transport in the North Atlantic Ocean. Global SAR in space sector market share is highly consolidated owing to the requirement of high initial cost, exceptionally skilled workforce, and multiple regulatory compliances. Major industry participants include Airbus SE, BAE Systems, Capella, Harris Corporation, Iceye, Israel Aerospace Industries, Lockheed Martin Corporation, MDA Information Systems, Northrop Grumman Corporation, Raytheon Company, Thales Group, and Uthercast. Industry participants are expected to focus on the development of multi-constellation projects for providing the global image information with updates ranging from hourly to daily basis. For instance, Capella Space is expected to complete deployment of 31 constellations by 2020 to provide hourly updates on the earth observation imagery data by the space borne synthetic aperture radars.